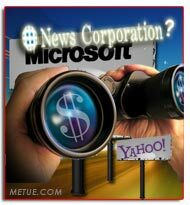 It’s about the price… News Corp is in… News Corp won’t play… Microsoft will destroy Yahoo…Yahoo isn’t worth more than what’s offered. There’s been so much commentary on the proposed mega merger, it borders on overwhelming. Anyone with an inkling of insight on tech and an opinion is weighing in while we all wait for the next dose of fact to supplant innuendo. While I wait, one wonder keeps hitting me: is Microsoft’s collective head in the cloud? That phrasing may sound odd but it’s not a typo. It is meant to be just one cloud – as in the so named concept of Cloud Computing. One of the rumors floating around the potential merger of Microsoft and Yahoo is that News Corp. is in discussions to get involved. The idea, which started floating on blogs like Tech Crunch and Silicon Alley Insider late last night and since escalated to Wall Street Journal reporting, speculates that News Corp is considering rolling MySpace (and possible more of Fox Interactive Media’s assets) into Yahoo. In exchange, and along with cash paid to Yahoo, News Corp and possible private equity partners would take a substantial stake, as much as 30% of the combined property. 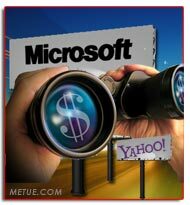 Dear Yahoo’s: We say NO to Microsoft. 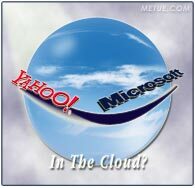 With advice from Goldman Sachs, Lehman Brothers and Moelis & Company, Yahoo has confirmed the rumors and officially rejected Microsoft’s proposal. Now, it’s back to Microsoft to counter, or escalate the possible takeover. In a letter to Yahoo staff, which is reprinted below, CEO Jerry Yang explained their logic. Video Sharer Revver Winding down? YouTube long ago won the popularity contest for user generated video. Other startups, even some of the same founding generation, have been battling for second place or to just survive. Some like Grouper, reinvented themselves. 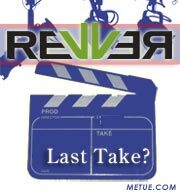 Now, Los Angeles based Revver, one of the earlier competitors, appears poised to bow out of the race entirely. Citing “sources familiar” CNET’s News.com is reporting that the company is in dire need of cash and may be sold for as little as $300 to $500k plus the assumption of an estimated million dollar debt. A price in that range would represent pennies on the dollar relative to total investment in the company. In 1998 Patrick McGovern and John Battelle launched the Industry Standard as a news magazine covering Internet business. They called it “the news magazine of the Internet economy.” The audience grew along with the Internet industry and by 2000, with high volume ad sales, the publication had annual revenue north of $100m and staffing in the hundreds (450 by some accounts). Then, as rapidly as they climbed, they fell. Victim of the same bubble they were reporting on. The Industry Standard shut its door in August 2001. Today, the magazine is being reborn; reinventing itself from a Web 1.0 publication to Web 2.0 social news website. Sometimes rumors sound crazy. Sometimes they’re so crazy, they end up becoming true. Microsoft proved that early this morning with the surprise announcement of an unsolicited cash and stock takeover offer for struggling web giant, Yahoo. Rumored at times to be possible, probably, and impossible, one thing a deal between the two never seemed was real. For more than eighteen months of chatter, partnership talk and innuendo, this prospect seemed like somebody’s fantasy. Now it is shockingly real. 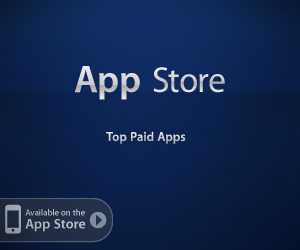 Microsoft has offered to pay $31 a share, which represents a purchase price of approximately $44.6 billion. The proposal would provide for cash and stock payment. Yahoo! shareholders will be able to choose either cash or stock, with the total deal being half of each. The offer represents a 62 percent premium above the closing price of Yahoo! stock on Jan. 31, 2008. For the few million Apple TV owners, the rental functionality and other software adjustments should be available within a week or two. Apple didn’t provide a reason when announcing the delay.